Recipe adopted from Vegan Sandwiches Save the Day by Tamasin Noyes and Celine Steen. [Recipe makes 8 ounces of tempeh bacon]. 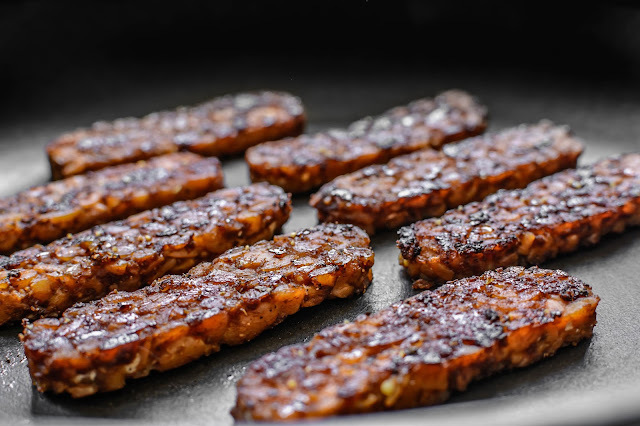 You can't have a vegan blog without a recipe for tempeh bacon, right? This is one recipe that we've been on the search for forever. Who knew it would be so hard? All recipes have a similar idea (cook tempeh in a mixture of soy sauce, liquid smoke, and spices), but the method of cooking makes all of the differences. We love this recipe because it calls for both baking and searing. Most of the other recipes we've tried call for just one method, and the result is disappointing. By taking advantage of both methods, you're able to impart great flavor into the bacon while also achieving a crisp exterior. ...now before we turn you lose, we have a quick note for bacon lovers who are trying tempeh bacon for the first time. There are many vegan recipes out there that imitate common, non-vegan dishes, in both taste and texture (macaroni and cheese, nacho cheese dip, and sour cream, for example). Vegan bacon is not one of those recipes that claims to do so. It's delicious, and you may prefer it to actual bacon, but tempeh has a much different texture than "regular" bacon. Tempeh bacon packs similar flavors (the smokiness, sweetness, and saltiness), but the texture is softer just due to tempeh being tempeh. If you give it a try without the expectation that tempeh bacon claims to be the same as real bacon, I promise you'll love it. Grilled next to a breakfast tofu scramble, or used in an avocado BLT sandwich, tempeh bacon is a staple in our kitchen. *this depends on how much sodium is in your vegetable broth and liquid aminos, and how much sodium your taste buds prefer. Using a sharp knife, cut the block of tempeh into 1/4-inch thick slices (cut parallel to the short side for shorter strips). In a small bowl, combine the broth, maple syrup, tomato paste, vinegar, liquid aminos, liquid smoke, cumin, coriander, salt, onion powder, and garlic powder, and whisk to combine. Pour half of this mixture into a 9-inch by 13-inch pan, and then place the tempeh strips in the pan, laying flat. Pour the remaining half of this mixture over the tempeh. Cover, and refrigerate overnight. Bake the tempeh uncovered for 40 minutes, or until almost all of the liquid has been absorbed. Remove from the oven and let cool slightly. Right before you want to serve, preheat a large non-stick skillet over medium heat. In two batches, brush both sides of the tempeh with olive oil, and cook on both sides until the desired amount of color appears, roughly 3 minutes per side.